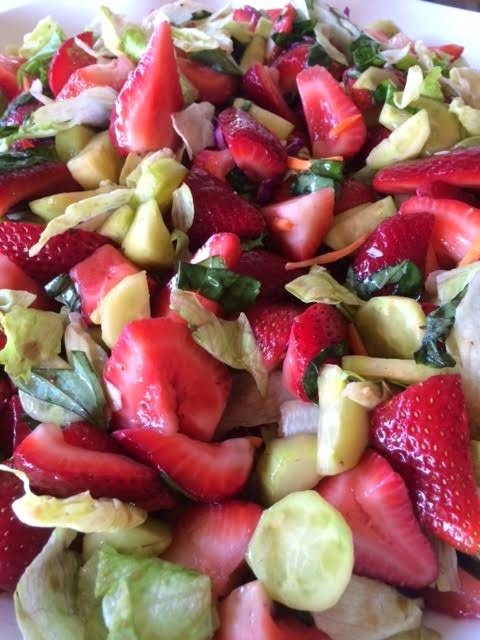 i was searching for a light summery salad with strawberries as the main ingredient for our women's event on friday and came across this one. the fresh basil and crunchy cucumbers had me sold on this right away! we received a lot of compliments on this salad and its super easy with most of the ingredients readily available in your kitchen. we did add some romaine lettuce to make it more of a salad and you could also lay the salad overtop lettuce. 1. peel and seed cucumbers; halve lengthwise, and slice thin. combine strawberries, basil, vinegar, and sugar. toss to coat and chill for 1 hour. 2. combine cucumbers and lemon juice; toss to coat. 3. after chilling, add cucumber mixture, salt, and pepper to strawberry mixture. gently toss to combine, and serve immediately.